Home Features The toughest of seasons: Why have the Liberty failed so miserably? The toughest of seasons: Why have the Liberty failed so miserably? Brittany Boyd, Sugar Rodgers, Tina Charles and Kia Nurse. Maria Noble/WomensHoopsWorld. 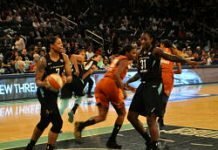 To say it has been a rough year for the New York Liberty is a grave understatement. They are currently sitting on a 7-25 record and are eliminated from the playoffs for only the fifth time in the team’s 22-year history. The Liberty have lost 10 in a row, which will likely turn into 12 with two more match ups to end the season, against No. 1 Seattle tonight and rejuvenated Phoenix Sunday. New York was missing five players due to injury earlier this week, and four for their game Wednesday. 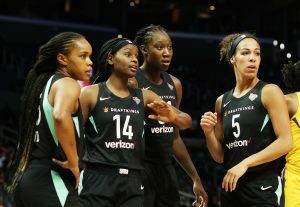 Just last season the Liberty – one of only three original WNBA franchises – finished third overall in the league, at 22-12, which has made their free fall this year all the more shocking. The home court for losers: Madison Square Garden Company locked the team out of the Garden itself and banished them to the Westchester County Center before the beginning of the season. The Center is a dimly lit, small arena that looks like a frumpy high school gym. It has to be depressing for professional athletes to play in a fully-unprofessional venue that seats around 2,500 when full, which it never is. It is likely a downer that so many in the team’s fan base are not able to make the long trek to White Plains to see them play. There is no home court advantage for the Liberty at this place, as they have averaged about 1,000 fans per game. 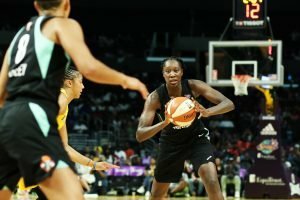 What can you expect when the WNBA’s theme for the season was “#JustShowUp”? How could all these things not affect play? Too many identical, unproductive posts: First-year coach Katie Smith inherited former coach Bill Laimbeer’s idea of a team. This idea included two nearly-identical four/five players in 6-4 Kia Vaughn and 6-3 Kiah Stokes. Neither has a scorer’s mentality, as each is more likely to kick out an offensive board to a teammate than to take the shot herself. Neither athlete is a true rim-protector, and neither has expanded her game beyond 10 feet. Stokes, who was a dynamic defender in college, has not really thrived in the WNBA, and gets about 12 minutes per contest, down from nearly 20 last year. Vaughn gets more minutes, and has very slightly better production. In an age of versatile post players, both Vaughn and Stokes are traditional power forwards, much like Laimbeer was when he played in the NBA. Both women around half of their shots, but nearly all of those are within six feet of the hoop, and none are made very frequently. Vaughn averages 5.5 points per game and Stokes, 2.4. They just are not helping New York much. At least one should go. The team does have a versatile posts in 6-5 Amanda Zahui B., who has size, range, and is improving her defensive skills and intensity – when she chooses to turn it on. She has shown promising improvement, as Smith has increased her playing time, and she is currently shooting 50 percent. 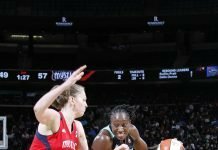 Tina Charles is averaging 20.1 points per game for the Liberty this season – the only player on the team with double-digit scoring. Maria Noble/WomensHoopsWorld. Over-reliance on their All-Star: The Liberty’s saving grace – not only in the post but overall – has been veteran All-Star center Tina Charles. She has carried the team on her back all year long, putting up 20.1 points and grabbing 7.2 rebounds per game – the only one on the roster to average double-digit scoring. She also plays a whopping 33.2 minutes per outing, a full 10 minutes more than Bria Hartley. The rest of the active players on the roster play 21 minutes or less. She has been magnificent this season, but Charles can’t win games for the franchise all by herself. Too many identical, inconsistent guards: Hartley, Sugar Rogers, Epiphanny Prince and Brittany Boyd are all 5-8 or 5-9. All are quick. Rogers and Boyd are decent defenders, but all are streaky shooters, and only Boyd averages better than 40 percent from the field. Prince has a good three-point percentage, but has shot just 43 attempts all year. Hartley has thrown up 101 threes, and made just 30. Rodgers hit just 32 of 102 attempts. Together, it is simply not enough consistent back court production – especially considering Charles is always double-teamed, leaving at least one guard open. Boyd has begun to emerge as a true point guard, with 5.3 assists per game. She has an OK three-point shot, and above-average defensive skills. Hartley has more minutes at the point and more experience, but far less production. Every team needs a backup point, but Boyd should not be in that position; she should start. That leaves the question: why is Rodgers is still playing the two guard position nearly half the time? New York has two big guards, and both have produced better than the shorter group of four. Shavonte Zellous (6-1) has been a solid performer for the Liberty all season, but has been forced to play the three-guard much of the time, and she has been out with an ankle sprain for weeks. Rookie Kia Nurse, at 6-feet, was a steal as the number 10 pick in the draft, and could develop into an elite player. She is an excellent defender and is the team’s second leading scorer, averaging 8.6 points in just 21 minutes per game. She was a 50 percent three-point shooter in college, but has struggled from beyond the arc (.301) as better defenders have focused on her in the WNBA. She is likely to be an asset for many years, and the Liberty might be better if she played more often. Injuries: An injury to a key player is usually enough to derail any team, and New York’s offensive flow has been disrupted by multiple injuries all season long. Zellous has been out since July 19, and Prince, since July 24. The loss of two of their better players hurts, but it really is not the excuse for this team’s futility. After all, the Liberty were only 7-16 when Zellous went down. No. 3-guard: The “3” is also called small forward or wing, and there are lots of good ones in the WNBA. 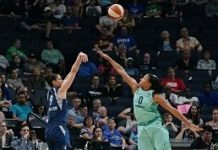 New York attempted to fill this position by signing veteran Marissa Coleman after she was cut by the Indiana Fever in training camp, but Coleman has not made an impact. With Zellous out, the position has been yet another gaping hole on the floor for the Liberty. Coaching: Katie Smith was one of the best players the league has ever seen, and she is well-liked by her team. Yet, her first year as a head coach has not been successful. It was a tough year to take over primary responsibility for a team, with far fewer practices than usual due to a compressed schedule. Smith, however, has failed to galvanize her team for success. And many of her coaching decisions don’t make sense. She did not begin giving productive Zahui B. and Nurse more minutes until the team was eliminated from the playoffs. Hartley gets more time at the point than dynamic Boyd, who scores more and dishes more dimes. Under-performing Rodgers continues to play many epty minutes. Smith has perhaps been too positive about the team’s potential when she should have been pushing them to realize that potential. And she should have found a solution long ago to their poor late-game execution, and failure to close out games. She cannot be held responsible for management’s abandonment of the team, but she is responsible for the days when the team just shows up. The team is still for sale. But no matter the owner or the playing venue, the Liberty will have to retool personnel and rediscover a winning spirit this offseason. It will take much work, but they owe it to their fans to raise the bar. It couldn’t get much lower. Upset, 10-0, first loss and…..trading cards?